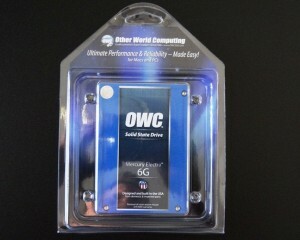 The SSD Review is giving away an OWC SSD, you can check it out over here. Have you been sitting on the fence thinking about getting an SSD? Drooling over the thought of having one in your own system? The simple fact is that a solid state drive almost makes it seem like the computer knows what you are going to do before you do. Its just that fast and have we got an opportunity for you!! Thanks to OWC, The SSD Review will be giving away a OWC Electra 6G SATA 3 SSD with less than an hour testing under its belt. This OWC Electra 6G 240GB SSD can be yours absolutely free of charge and we will ship it to you directly from The SSD Review. It is our sample drive which is a full retail version and its review can be seen here. Where else can you actually see the performance and detailed pics of a drive before you get it in your hand?